Ever since Tony Blair took over the EU presidency in July the relationship between the UK and France have been somewhat freezy. 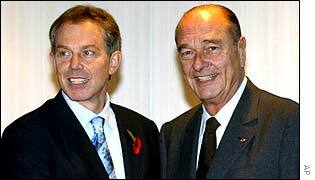 The French and British views of Europe have always been different from each other, but when Tony Blair in his opening speech of the presidency proclaimed the end of the restrospective European social model of structural aid, social and agricultural benefits Jacques Chirac and his French peers felt they were being ambushed by an English market oriented version of Europe. As a counter to the British presidency's rhetorics, France was positioned as conservers of the European model as it was against the destructive Anglo-Saxon dominance. And so the lines were drawn between two of Europe's oldest members - however, that was back then. Now it seems that Blair and Chirac have found common grounds again; in a recent meeting in Paris it appears that the two grand hommes d´etat have agreed not to disagree, at least publicly, anymore. "For the Europe of tomorrow, we are both determined to be ... not a force of division, but a force of harmony," Chirac said with the prime minister standing at his side." - See article from The Guardian here. "U.K. Prime Minister Tony Blair and French President Jacques Chirac vowed to put recent rifts behind them, pledging to work together to promote European economic competitiveness." - See Bloomberg article here. Now, what can we make of this reconciliation of France and the UK? The budgetary burden of structural and agricultural subsidies, Turkey's future membership, and the indisputable fact that the Lisbon agenda will not nearly be fulfilled by 2010. Perhaps the Rhineland engine room of Europe should listen a bit more to the Anglo-Saxon cousin on the opposite bank, but one thing crucially remains in my opinion and that is a change of leadership. Blair, Chirac, and Scroeder have been at the wheels long enough and they need to step down preferbly sooner than later to let in new blood and ideas. Can bloggers make the green grow?